OLYMPIA – TwinStar Credit Union opened a new branch in Aberdeen at 416 E. Market St. on Monday, May 1, 2017. The new branch replaces the former Aberdeen branch that was located across the street at 401 E. Market St. Drive-thru and ATM services will continue at the previous location. The new Aberdeen branch represents a step forward in member service. TwinStar was able to design the branch to accommodate a new banking concept that will more accurately meet member needs. In addition to traditional teller lines, there are several new meeting places in the new branch. TwinStar employees are available to perform any transaction a TwinStar member needs from nearly anywhere in the branch. The new Aberdeen branch now offers Saturday hours so that members who are busy during the week can visit at a more preferable time. There is also a technology bar to help members use online and mobile services, a place to charge their phones and computers, and a children’s area with tablets to entertain them. “We’re very pleased to introduce this concept to our members in Aberdeen. TwinStar has developed quite a list of new technologies that provide speed and convenience in the last few years and this branch will help connect members to our new applications,” Kennedy said. TwinStar Credit Union has operated in the Grays Harbor area for nearly 40 years. The new branch underscores a deepened commitment to the community. “TwinStar serves just over 9,600 member households in Grays Harbor County. We are excited to recognize their loyalty with a branch that will make it easier to do business with us and be there for at least another 40 years,” said Kennedy. 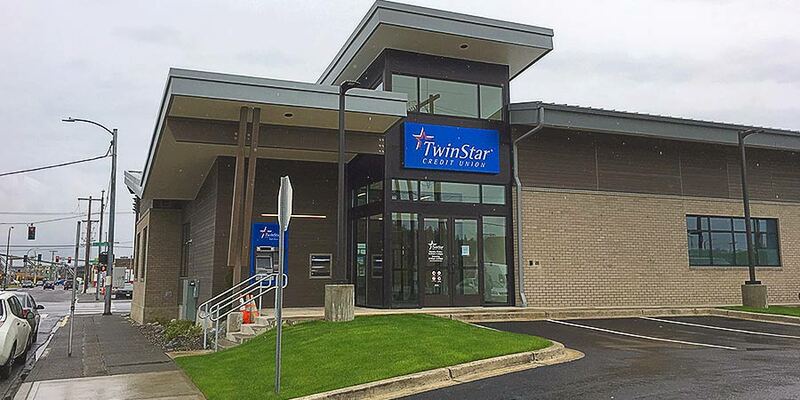 TwinStar Credit Union manages $1.2 billion in assets and operates 20 branches from Tacoma, WA to Portland, OR.